PHOTO: Dr. Sylvanus Adetokunboh Ayeni (in glasses), with students in the primary school at Koro-Ekiti, Kwara State, Nigeria, West Africa and some staff members of Pan Africa Children Advocacy Watch (PACAW), Inc.
Dr. Ayeni is a Neurosurgeon who was born and raised in Nigeria. He attended Baptist Boys High School, Abeokuta from 1958 to 1962, and graduated from the College of Medicine, University of Lagos in 1972. His Post Graduate training in the USA in General Surgery was at Brookdale Hospital Medical Center, Brooklyn, New York (1976 - 1978) and in Neurosurgery at the University of Wisconsin in Madison, Wisconsin from 1978 to 1983. He is President and Founder of Pan Africa Children Advocacy Watch (PACAW), Inc. -- www.pacaw.org -- a non-profit organization involved in the education of children and leadership training in Africa. He is an authour and has been involved in development issues in Sub-Saharan Africa in the education and healthcare sectors for many years. How lessons from Dr. Martin Luther King's life and philosophy can help to mitigate the leadership crisis in the region. When the next viral epidemic like Ebola virus strikes again, are we ready? Does Africa still need as much of your tax dollars in foreign aid? Giving is noble; but how beneficial is the current structure of foreign aid to Africa? 2. Why is the majority of nations of Sub-Saharan Africa so poor despite the fact that most of them have more natural resources than nations in the developed world and the emerging economies of the world? 3. It has been widely reported that corruption is a major problem in the leadership of the nations of Sub-Saharan Africa. Why are these leaders so corrupt and what can be done about it, especially regarding the next generation of leaders? 4. Monday, Jan. 21 is Dr. Martin Luther King Jr. Day. What lessons in his life and his philosophy can the leaders of the nations of Sub-Saharan Africa learn from? 5. Moving forward, how can the young generation in Africa be made aware of the importance and magnitude of the lessons from Dr. King’s life? 6. What are the most important ideas you are sharing in the book that will benefit the readers? 7. Since you believe that no amount of Foreign Aid can reverse the poverty in Sub-Saharan Africa, what are the needed changes to reverse the poverty in these nations? 8. What changes will you like to see in the delivery of Foreign Aid? 9. What do you consider the hidden negative consequences of Foreign Aid? 10. What should non-profit organizations, churches, foundations, and other donors working in Africa demand from the leaders of these nations? 11. A major problem in the nations of Sub-Saharan Africa is the lack of sustainability of the programs handed over to the communities. How can the donors improve this situation? 12. We have seen the drowning of people including children whose bodies were washed to the shores of the Mediterranean Sea as refugees flee from the civil war in South Sudan and from oppressive regimes in several Sub-Saharan African nations. How do your ideas in this book apply to these situations? 13. Did your upbringing play a role in your writing and did you use it to your advantage? 14. Where can people buy the book? 15. 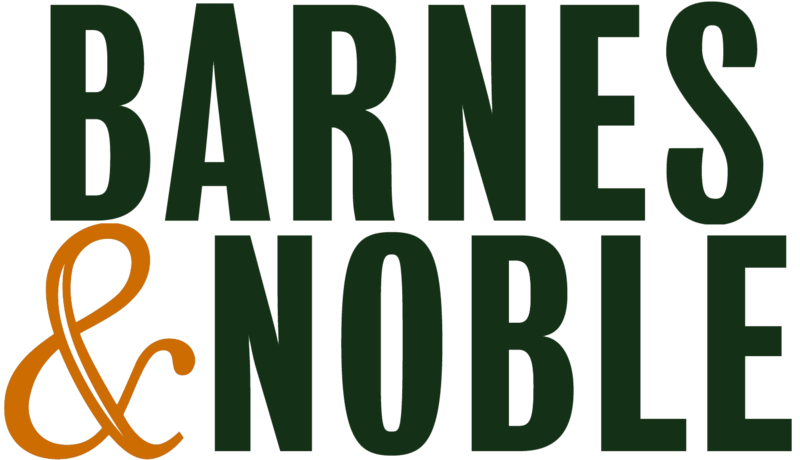 Based on your experience as a writer, what recommendations would you give to authors just starting? This, in my honest opinion, is an absolute must-read.  “Rescue thyself” lays out the truth about the state of sub-Saharan Africa and of Africans, but does so from a scientific, historical, political, social and even philosophical point of you. This book educates and informs us. It forces us to look in the mirror and to understand the solutions which will actually turn things around. Anyone who wants to learn African history or wants to understand why sub-Saharan Africa is in such disarray and always in need of rescue... anyone who wants to reverse that trend should read this book. It gave me goosebumps. I must admit over my many decades of life, I have indeed donated considerable amounts in time and in charitable dollars to improve the educational and poverty conditions of Africans and still do. I have made two trips there to participate in some of these projects and chaired charities that are involved in the process. But something has always concerned me about the whole thing. Ayeni’s book confirmed my suspicion. The rest is up to me, and you, and the kind of African leaders which may or may not emerge in the days ahead. Dr. Sylvanus Adetokunboh Ayeni was born and raised in Nigeria. He is a retired neurosurgeon, living in the U.S. and has for years been involved in the education of children in Africa as well as in attempts to improve Africa’s healthcare sector. If anyone knows about the ins and outs of Africa’s decades' old problem of little to no progress, it’s Dr. Ayeni. He delivers his message with incredible doses of passion, love, logic, and statistics. The book opens with a quote from Roman Statesman Marcus Tullius Cicero that reminds me of the attitude of a recent American President. I was hooked. The author divides his work into three major sections. The first one sets out and debunks some detrimental misconceptions both Africans and the rest of the world may have about Africa and Africans. Here he deals with misconceptions related to the creation of mankind, the purpose of life, and the essence of nationhood. Part II deals with some fundamental requirements for change, including visionary leadership, production vs. consumption (especially of natural resources), solid infrastructure, and meaningful education programs. In Part III, Ayeni talks about some other things that need to change if even all the requirements he identified in Part II were to somehow miraculously appear. These conditions he says are “inward” ones implying they must come through the heart and through the mind. 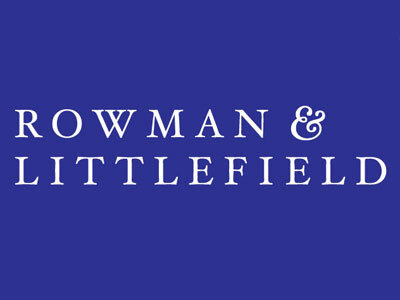 They include a change in beliefs, desires, and behavior (especially of leaders); a change in governance and the how the Rule of Law is achieved and adhered to; and a change in the roles of exterior donors and NGO’s. With respect to beliefs, desires, and behavior, Ayeni engages ancient material involving Socrates and ‘the Ring of Gyges’, which I thoroughly enjoyed and learned much from. The main idea that emerges is the need for leadership to start thinking about the masses and not themselves. The reader reaps a lot of knowledge about each of these areas as he/she works his way through the book. Admittedly, for some of us who are more type A in our personalities, there is some repetition but the author feels, and helps us understand, how one cannot overstate what is obvious and yet no one has been willing to tackle it head on – perhaps as he himself often says, “it won’t be easy” and “there are no simple or easy answers”. For me personally, Rescue Thyself not only taught me much, but I thoroughly enjoyed the author’s knowledge of literature and history, and his careful use of both. His quotes from many sources are appropriate and well placed. And many of his own are also worthy of being cited elsewhere. One memorable one for me, when he debunked any excuse Sub-Saharan Africa (SSA) might have as to why it is still in trouble was “Except in the Garden of Eden, no society started out rich.” Another one is: “The color of the skin does not determine the quality of the output of the human brain.” I have underlined much of the book for future reference on various topics. Clearly, his focus is SSA and he explains exactly what countries are included in that designation. He very succinctly tells us what was going on in SSA while the Renaissance, the Reformation, the Age of Enlightenment, and the Industrial Revolution were taking place elsewhere. His use of statistics alone is worth the price one may pay for the book. One could prepare many a presentation from what Ayeni gives us through statistics. But the bottom line of the good doctor’s message is this: it is time for the foreign-aid community to rethink its strategy. That includes global organizations like the U.N., individual countries like the U.S. and Canada and others, NGO’s, missions, denominations, churches, and individuals. And if you think your support of “digging wells” in SSA or supporting foreign schools is the way to go, Ayeni will cause you to think again. In his last chapter as well as his epilogue, the author gives some very practical suggestions as to what can be done now. And he also warns us of what may well happen if these things are not done. Scary. This is a must-read for anyone working with NGO’s in Africa. It’s also a must-read for pastors and mission leaders, and of course, the individual who cares about helping his or her less fortunate brothers and sisters in the world. Well done, doctor. Ken B. Godevenos, President, Accord Resolutions Services Inc., Toronto, Ontario, May 22, 2017. Rescue Thyself - Change in Sub-Saharan Africa Must Come From Within, by Dr. Sylvanus Adetokunboh Ayeni, is a racist piece of literature. By necessity. Rescue Thyself is one of those rare books that slaps the reader in the face with reality, sometimes so ugly it brings tears to eyes. Dr. Ayeni pulls no punches and lays blame where blame is due. He is not an 'outsider' providing socially and culturally illiterate commentary, he is a sub-Saharan African speaking about the world he knows on a firsthand basis. He neither points a finger of blame toward the western world nor extends an open hand begging. 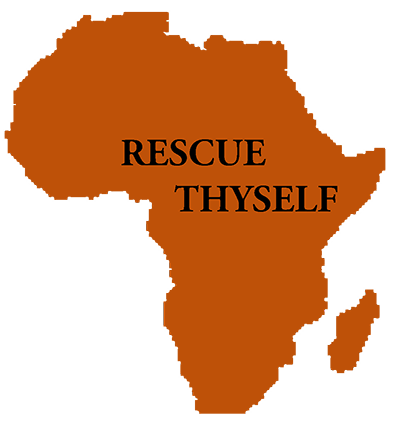 Rescue Thyself takes the reader into the Sub-Saharan African mindset and reveals a world of extreme opulence and poverty, where greed has replaced need, and corruption has so putrified politics, instead of governments serving the public, they feed off it. But, Dr. Aneyi does more than criticize, he clearly identifies the complex issues at play, encompasses them in geopolitical, cultural and spiritual history, then provides insightful and viable solutions. "Change in Sub-Saharan Africa Must Come From Within" goes to very heart of Dr. Ayeni's passionate and articulate message in this fabulous bookumentary. The reader is provided ample contextual background and social contrasts to help understand the quiet desperation being experienced on a scale that is simply stunning. However, his work is not just dry and analytical. I strongly suspect that Sylvanus had a callus on the inside of his cheek after writing this manuscript, formed by his quick wit and subtle sarcasm that slips in delightly and unexpectedly throughout the book. Still, I found it hard not to grow angry at the international corporations and governments who have economically enslaved millions of Sub-Saharan Africans in their own nations and chained them to deplorable and horrible conditions in order to make the rich even richer. education of children in Africa (http://www.pacaw.org/). Dr. Ayeni is actively helping to empower Africans to take control of their own destiny, and his drive to nurture future leaders is nothing short of heroic. Rescue Thyself - Change in Sub-Saharan Africa Must Come From Within, by Dr. Sylvanus Adetokunboh Ayeni, is an excellent book, written by an excellent human being. This book is more than merely a "need to read', it is political prophesy, a heartfelt cry for help for sub-Saharan lives, and a challenge to sub-Saharan national leaders to grow some moral manhood and start to lead, and cease to feed on those in need.